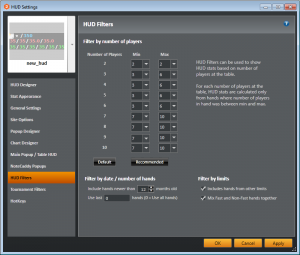 Holdem Manager 2 is one of the leading poker software products on the market today. This site is dedicated to bringing you tips, and areas of HM2 you’ve probably over looked, along with some great tutorials. 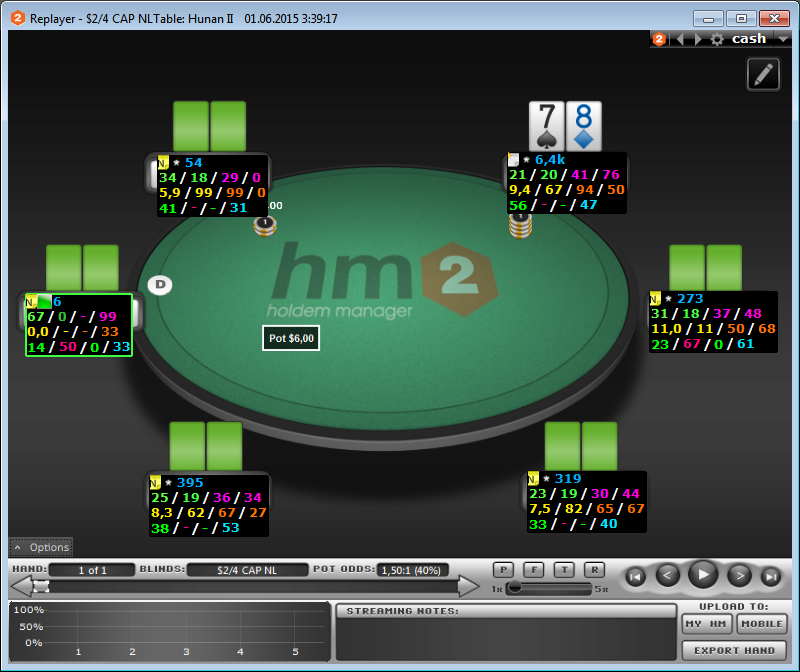 This site is updated regularly to provide more tips and tutorials as changes and features are added to HM2. 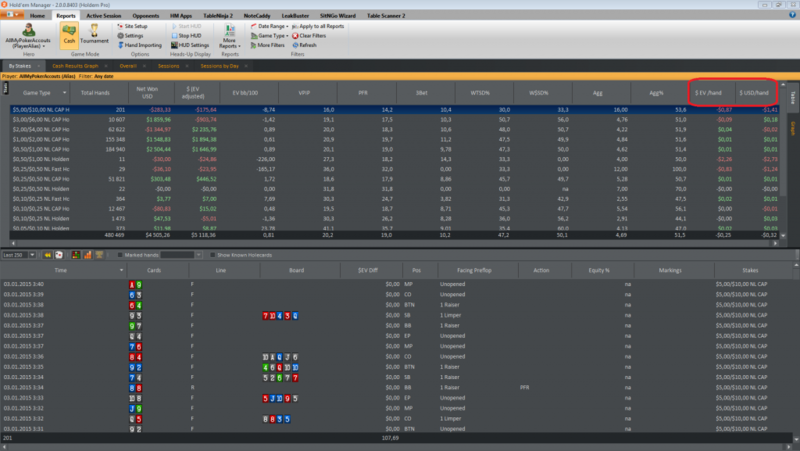 Leak Buster – Poker stat analysis software. Hone your poker skills by using all the hands and data you’ve played online, and allow Leak Buster to find your biggest poker leaks in minutes. 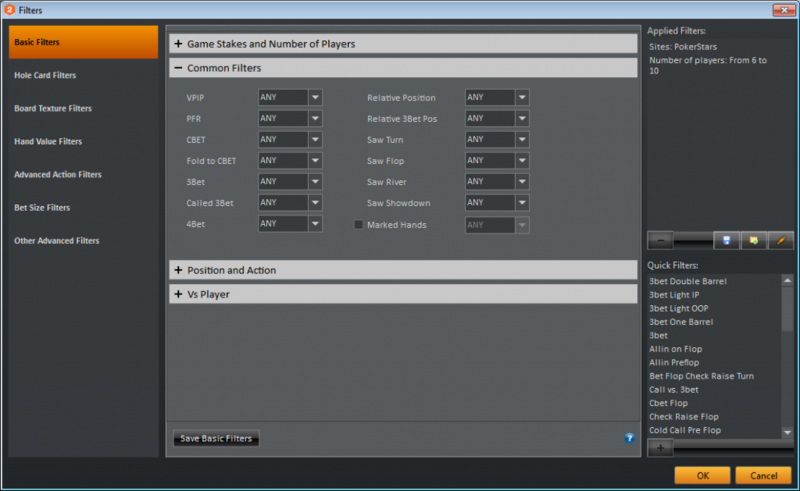 Ace Poker Drills – Poker Quiz and training application. 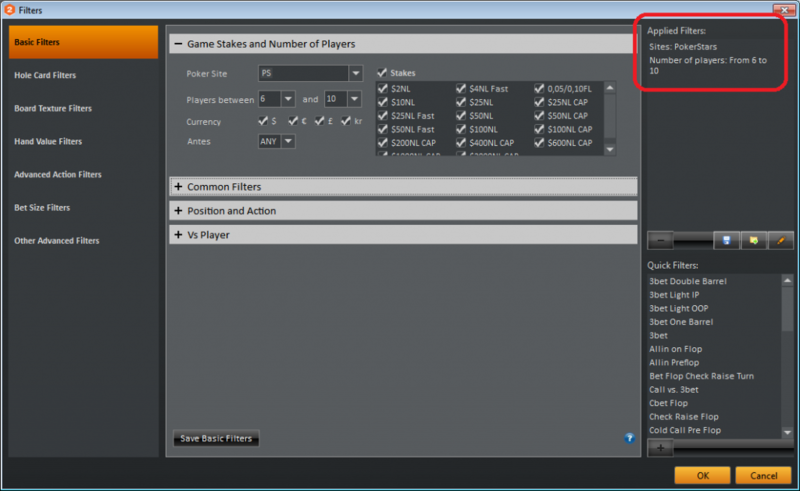 Learn proper pre-flop and post flop play in a poker quiz style format with ace poker drills. Bovada Card Catcher – Bovada poker HUD. 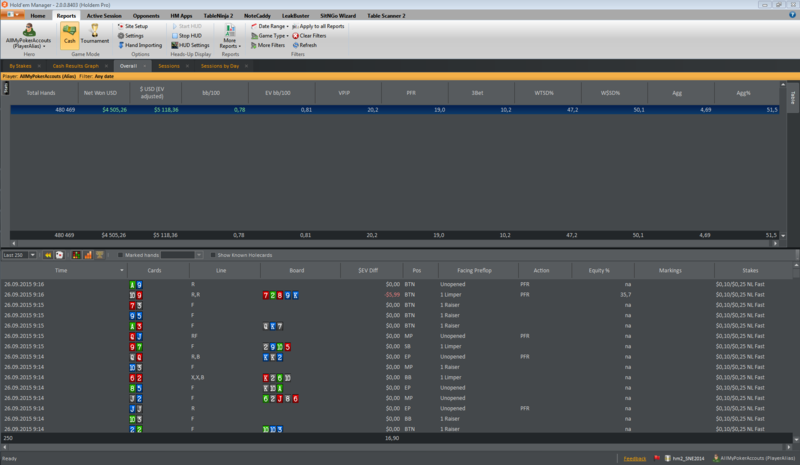 Grab your hands in real time and run a HUD on bovada poker with Bovada card catcher and your favorite poker database. 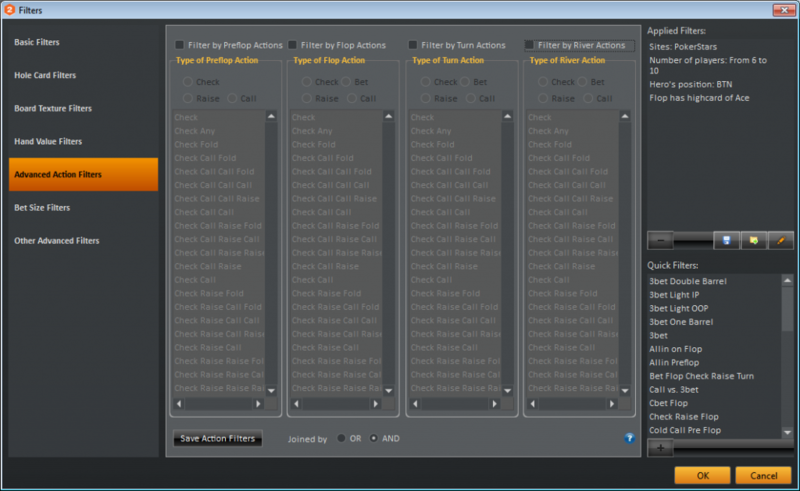 In this section we’ll talk about Alias Names in Holdem Manager 2. Aliases in Holdem Manager 2 allow to combine multiple hero names into a single player name. 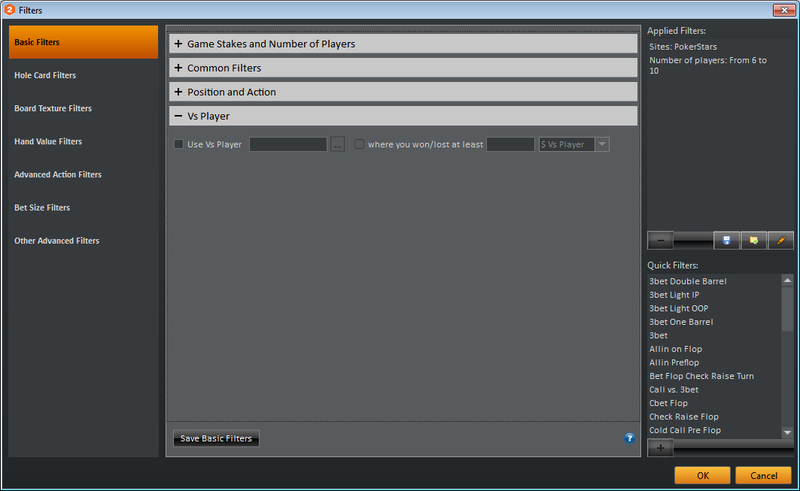 It very helpful if you play multiple poker rooms or if you want. 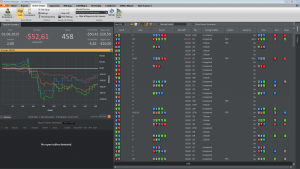 This feature is very helpful if you play a few poker rooms at the same time and want to monitor the results of an active session, or if you want to analyze the game results of a whole group of other players, for example, we create a group of 5 players. You can setup Alias Names in two different ways. or 2. Click “Setting” button, like on the picture below. In the opened window, you can add and remove Alias Names, also you can add and remove a Player Site Names in each Alias Name. For example, we will create Alias Name with all Player Site Names for each poker room where we play. For this press “+” button, like on the picture below. In the opened window, enter your Alias Name and press OK. I chose AllMyPokerAccounts name, you can choose any name you like. 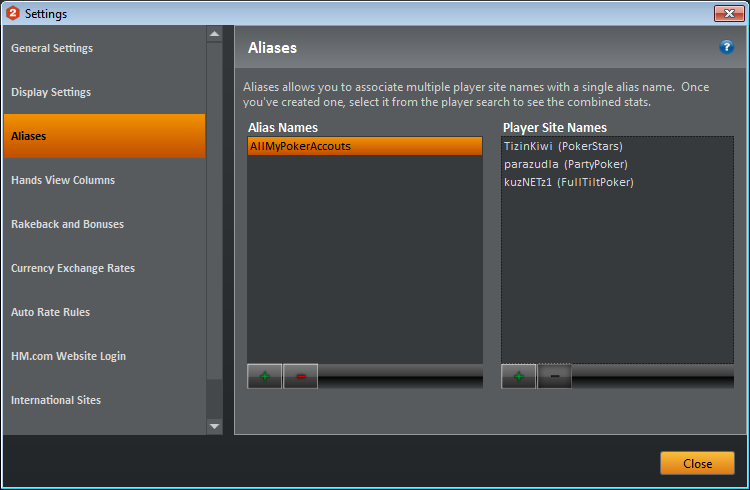 Then, you have to add Player Site Names in Alias. For this you need to highlight your Alias Name and press “+” button, like on the picture below. In the opened window Current Player, you can put your Poker Site Name and press button OK.
Also I created Alias Name Top5_Regs with 5 top regular players in my base. Then we can click close button and go to Report Tab. Enter your Alias Name, like a usual player name in the new opened window and choose your Alias Name in the list, then press OK button. Now we see the overall statistics for all our accounts of our Alias. 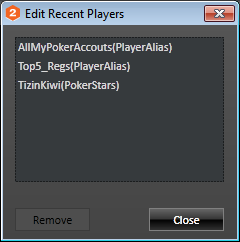 Repeat steps for another our Alias Name and select Alias Top5_Regs. Now you can easily switch between your Alias Names. 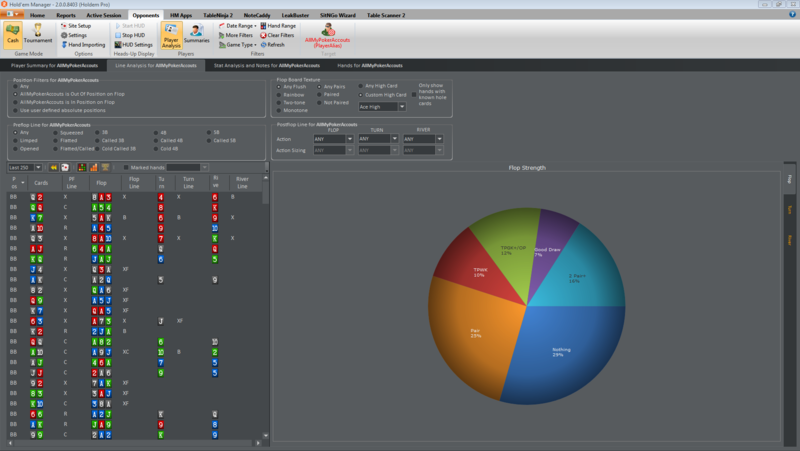 For example, you can switch between your active gaming sessions and analyze the database of regulars. To remove Alias Name you need to highlight Alias Name in the list, which you want to remove, and click the “-” button, like on the picture below. To remove a player from Alias Name you need to highlight a player click “-“, like on the picture below. Also you can remove Alias Names from the menu, but not from your base. For this press “Hero” button, press “Edit list…” and remove Alias Name in the opened window if you want. 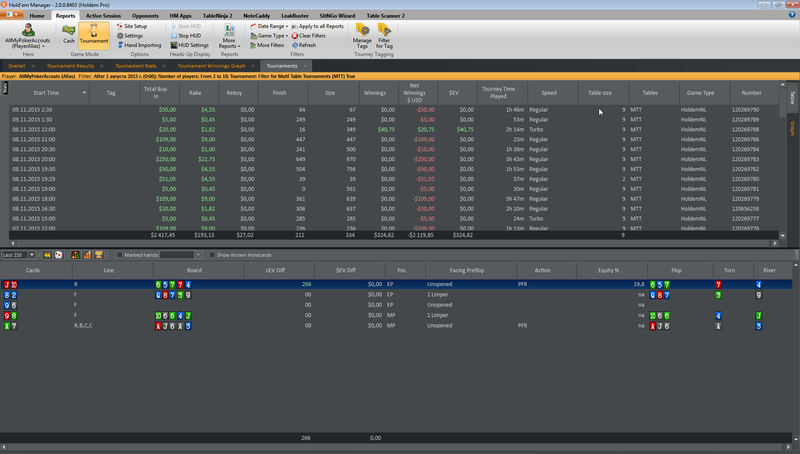 In this section we can edit Columns, which will be display in the standard Reports in the bottom of the screen. It’s useful, we can take away all unwanted things and focus on game analyze. For example, let’s consider “Tournaments” and “Tournament Results” tab. It had to look like on the picture. 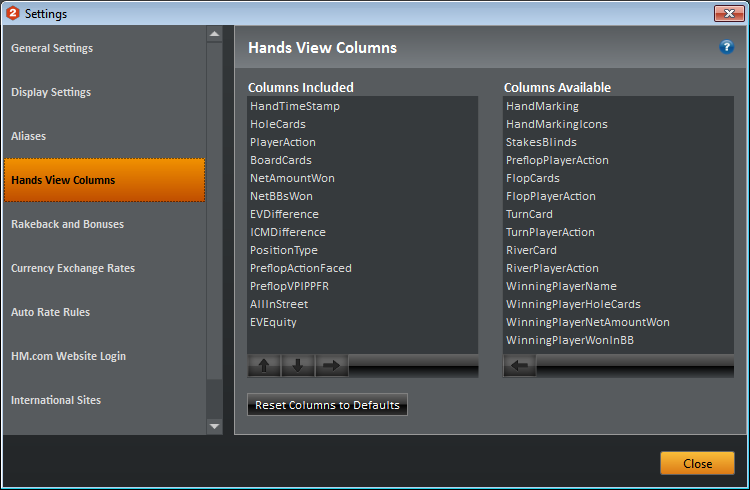 For tuning “Hand View Columns” press “settings” button and choose “Hand View Columns”. There are two sections. In the left section there are the Columns which we are using now.In the right section there are all available Columns. Edit left list like you want. For remove from the left section select Column and press button like on the picture. 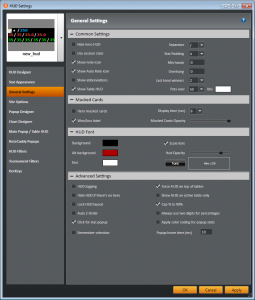 For addition select need element in right list and press “left arrow” button. Buttons “Up” and “Down” are used for sorting elements in the list. After all actions press “Close” and return on the Report tab and you can see the result. “Auto Rate Rules” allows to define “Notes Icon” for opponent on the base of the rule, which we can change. 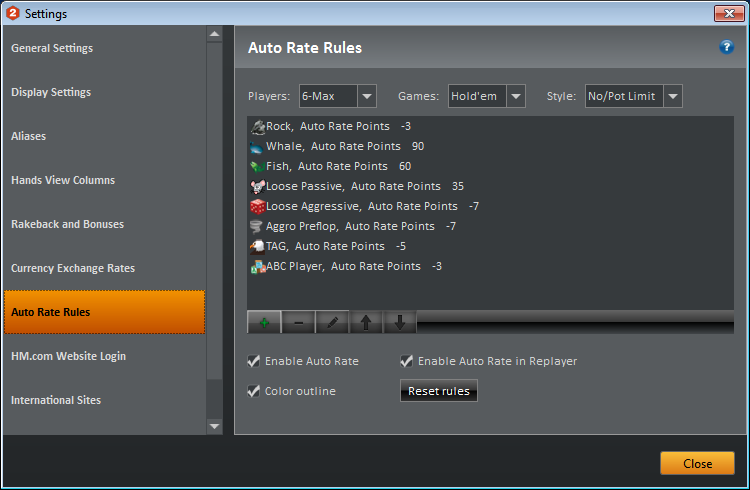 For tuning “Auto Rate Rules” press “settings” on the panel and choose “Auto Rate Rules”. You will see the following opened window. In the dropdown menu “Players” you can choose the type of table for our rules. 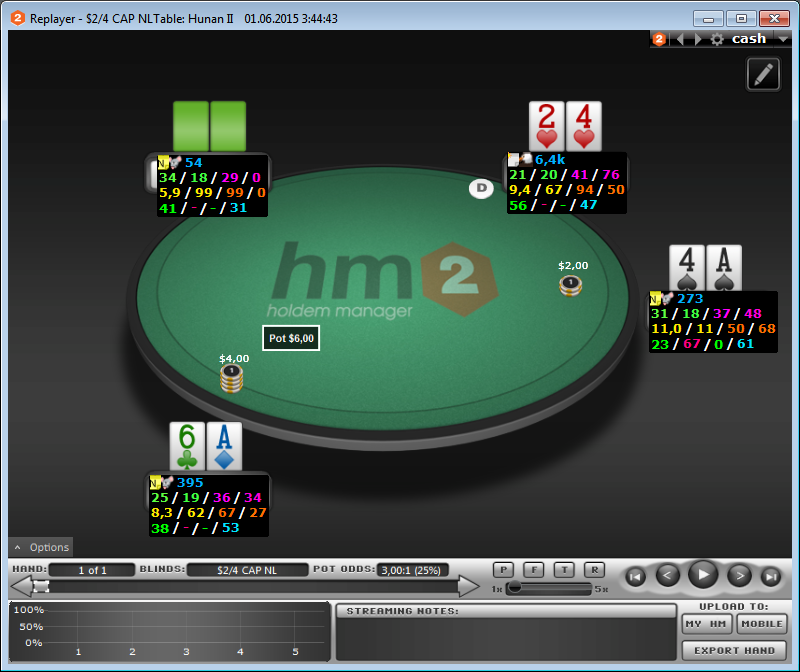 In the list “Games” you can choose Game Type like Hold’em, Omaha or Omaha 8. 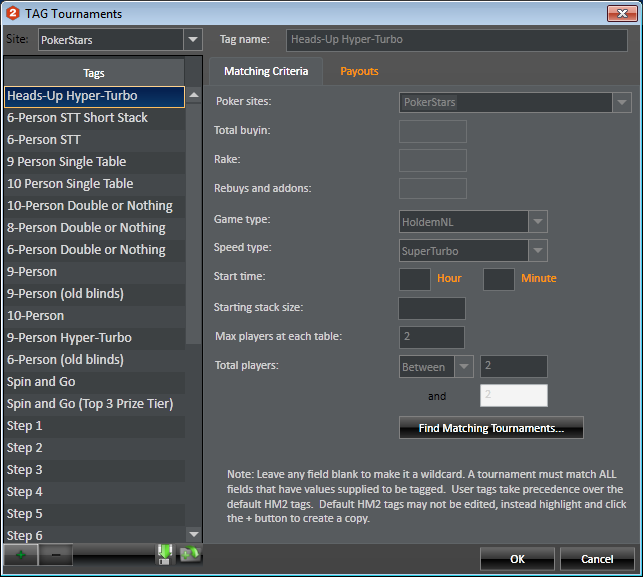 In the list “Style” you can choose Limit type like as No/Pot Limit, Fixed Limit or Tournament. 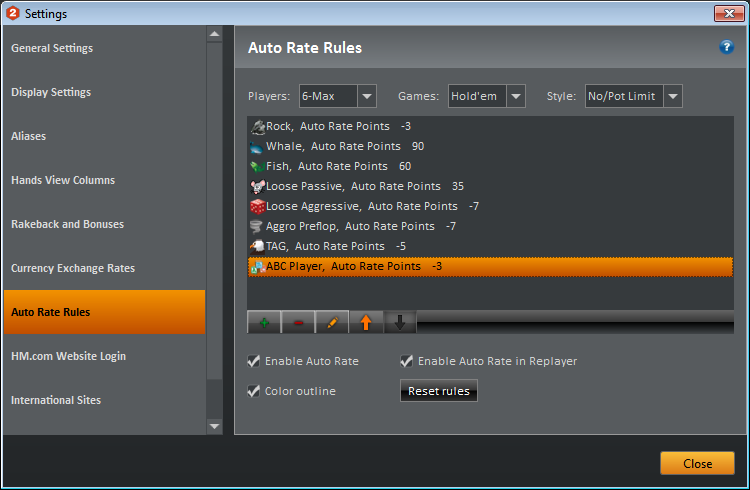 In the bottom section of the window you can check/uncheck such parameters like “Enable Auto Rate” и “Enable Auto Rate in Replayer” which will be automatically use our rules for all players on the tables or in the Replayer, respectively. “Color Outline” adds color outline on the opponent HUD panel. Rules settings, which help us automatically define the type of opponent, are available in the main section of the window. For example, I chose next settings: 6-max, Hold’em and No/Pot Limit. 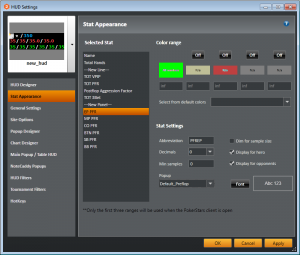 Open the table in Replayer which is suitable for these parameters. 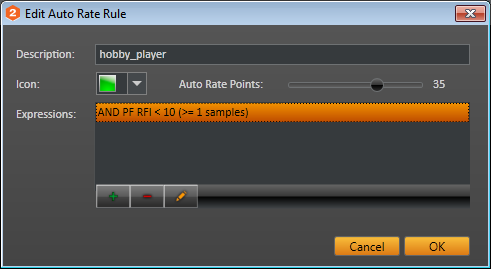 As you can see, because we chose “Enable Auto Rate in Replayer” parameter, Holdem Manager 2 added Notes Icon for players, which characterizes their game style. Only good players on this table. Let’s tune own rules. 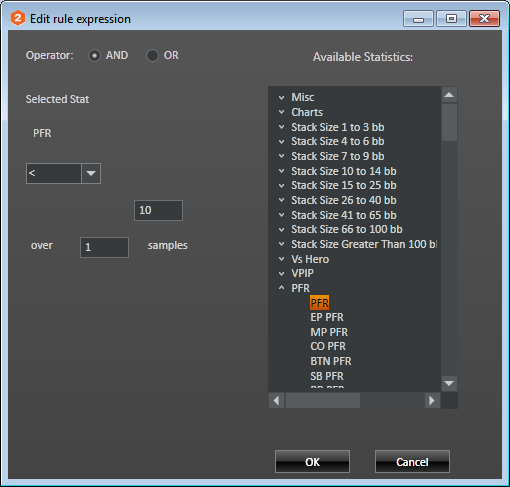 For start let’s remove all rules created by Holdem Manager 2 automatically. To do so select each rule and press “-“, like on the picture below. Let’s create a new rule, to do so press “+”. In the field “Description” put the name of the player type. 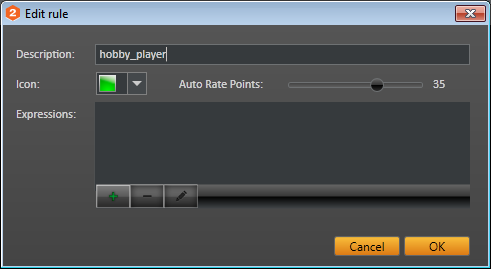 I chose “hobby_player”, you can choose any name you like. In the dropdown list “Icon”, choose icon for this player type. By the help slider “Auto Rate Points”, point out how much points is needed for this player type. The strong player has a little points, the weak player has a lot of points. I chose 35 points. You can play with value and understand what value characterizes your “Hobby Player”. Also we have to define at least one “Expression”. Press “+”. And we are in the window “Edit rule expression”. In this window you can find a lot of stats, from VPIP and PFR to stats which were created in NoteCaddy. Operators “AND” and “OR”, define how this expression will work with other expressions. For example, I chose PFR. In dropdown menu we would choose the way of handling this stat: Between”, “>”, “>=”, “<” or “<=”. Also we have to define quantity of samples. Press “Ok” and look at results. You can also add and remove Expressions with “+” and “-” buttons or edit existing Expression with button “Pen”. But for example it’s enough one Expression. Let’s look at result. I found the table with suitable player. 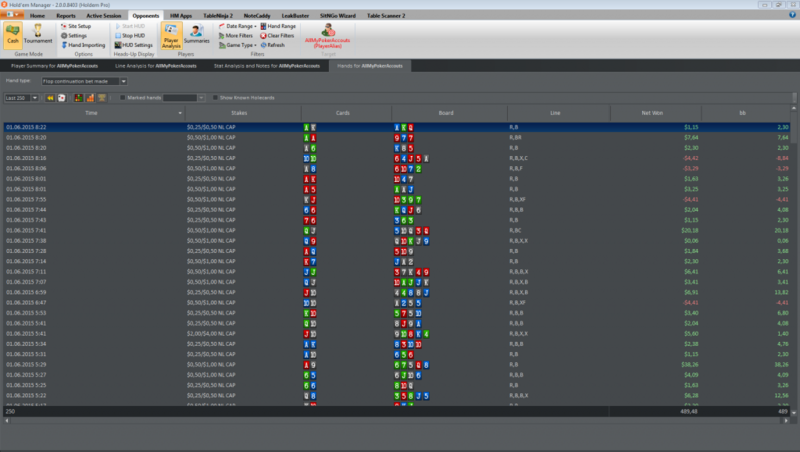 I think it’s the most useful tab in Holdem Manager 2. 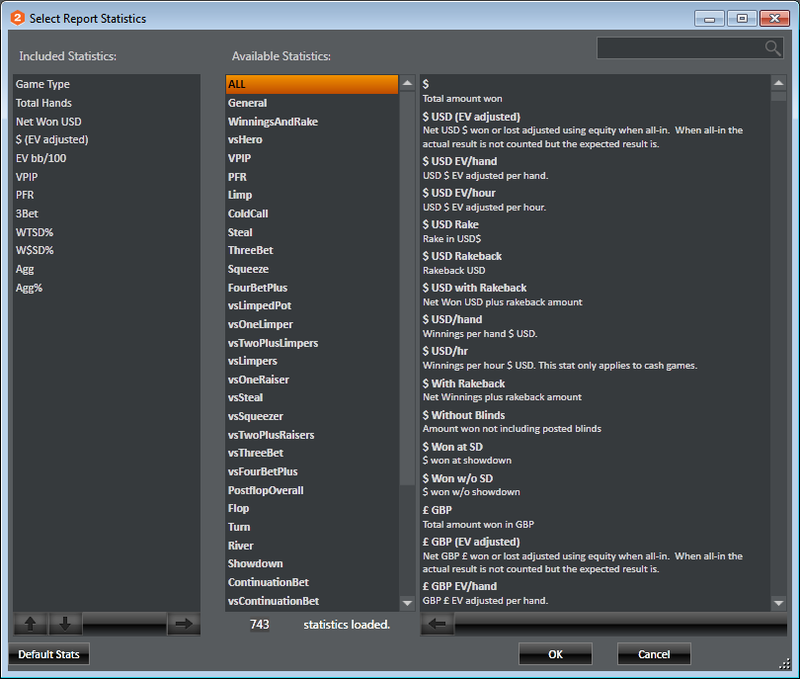 Here it would be able to set up any reports about your game or about the game of your opponents. On the top panel there is the button “More Reports”. If you’ll press on it you could see all available reports в Holdem Manager 2. 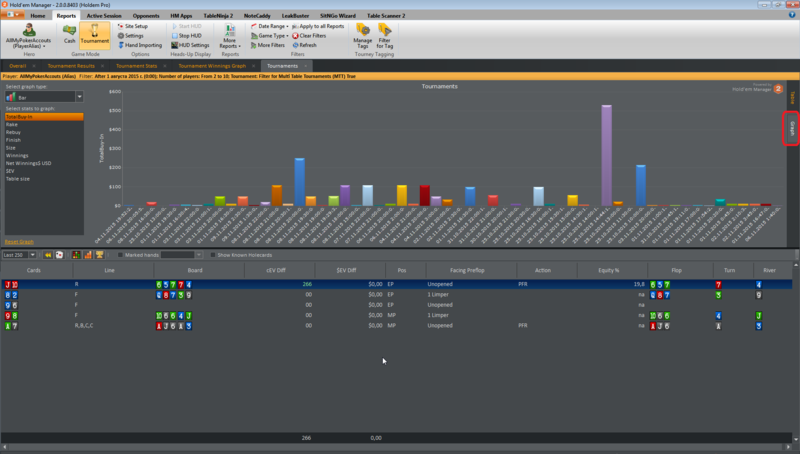 Choose needful Report and just click on it and it would add in main part of the window. In the box below there is a section where we can see specific hands according to chosen parameters. 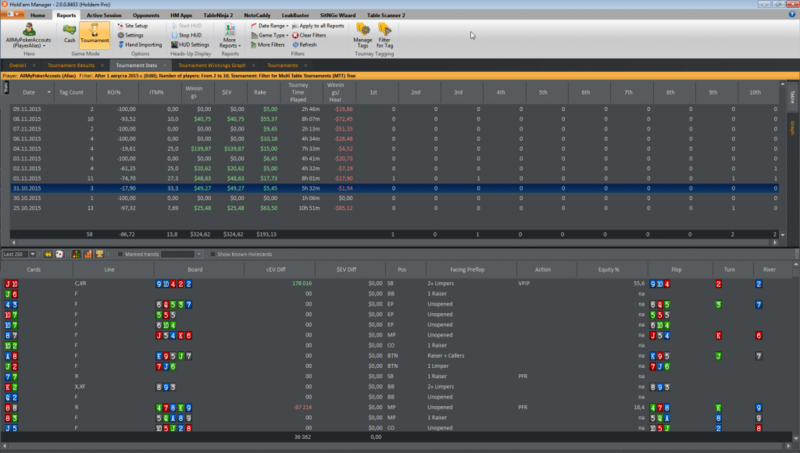 Here our hands are sorted so it’ll be comfortable to analyze deals on played limits. 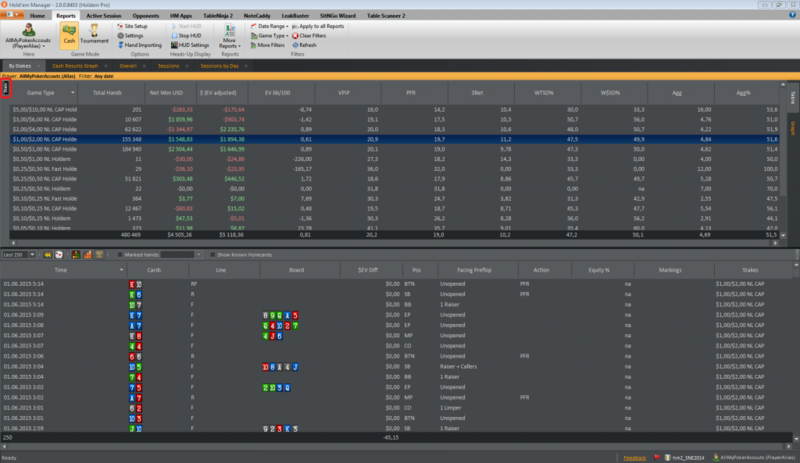 On the picture you can see that it is possible to grade hands on Type, Total Hands, New Won, EV adjusted VPIP PFR 3Bet, etc. And if a specific line will be select, in the bellow part there will be available hands just played on this Game Type. 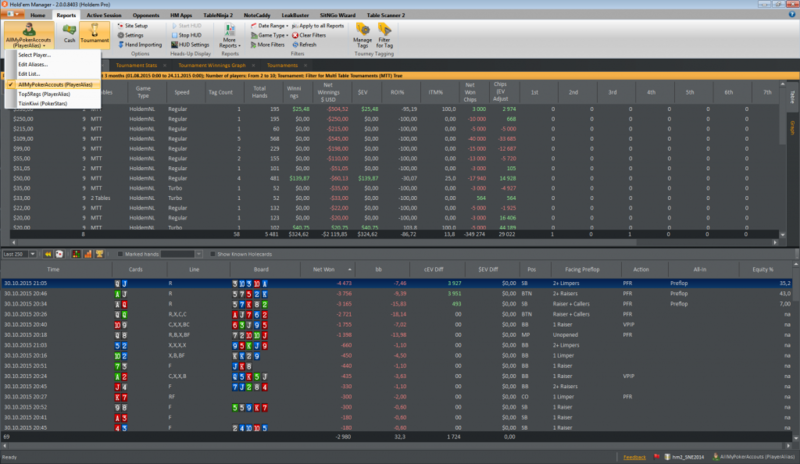 Also we can add supplementary Columns in the main part of the screen. To do so press Stats pictured bellow. 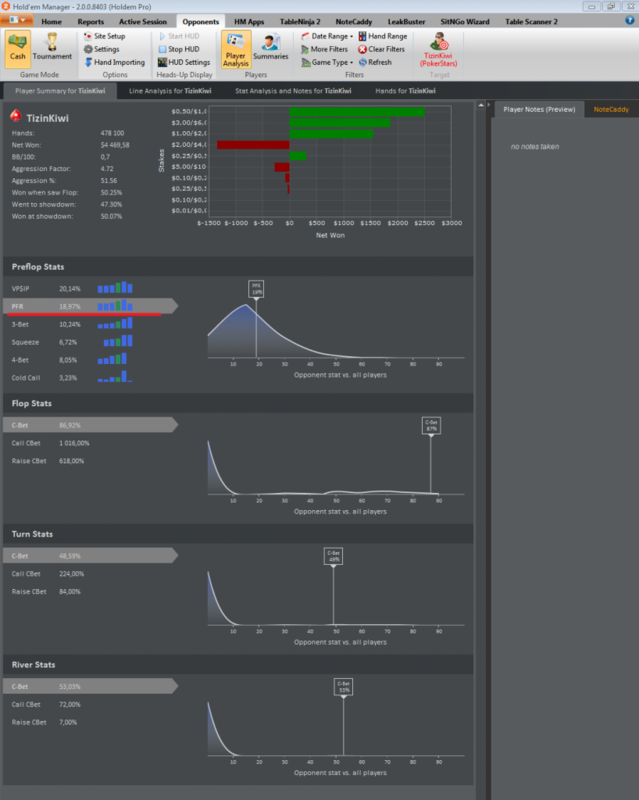 The window where it is possible to add and to remove statistics, will be opened. 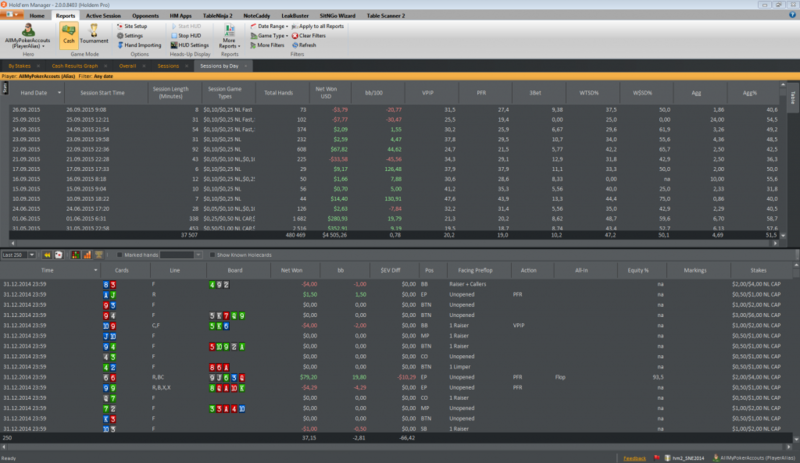 In the left part of the screen there is statistics, which is used us in this Re-port. 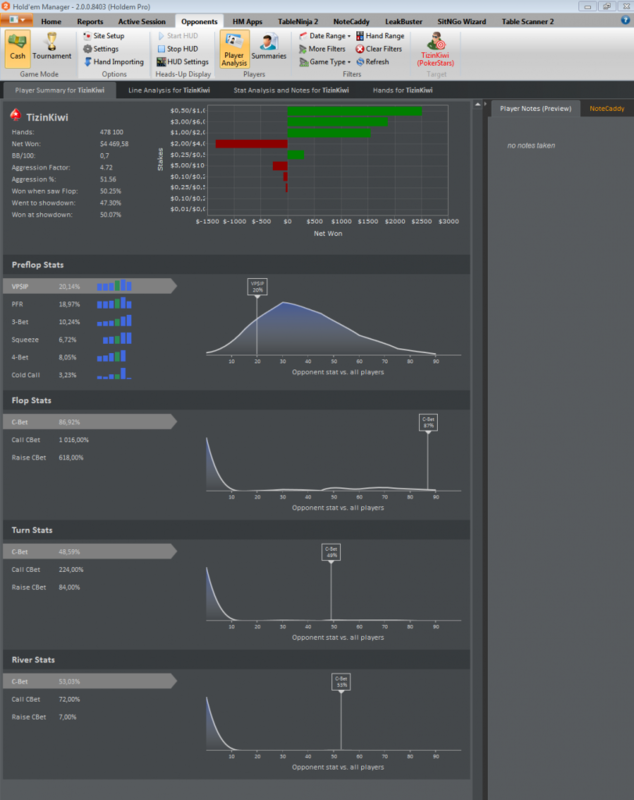 In the right part is available all statistics, which is in Holdem Manager 2 (in the center bellow it is shown the general quantity of the available statistics). 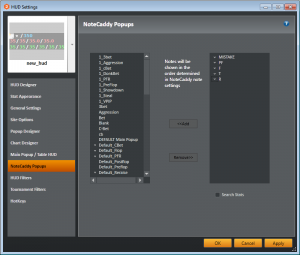 There are also stats made us manually in NoteCaddy. 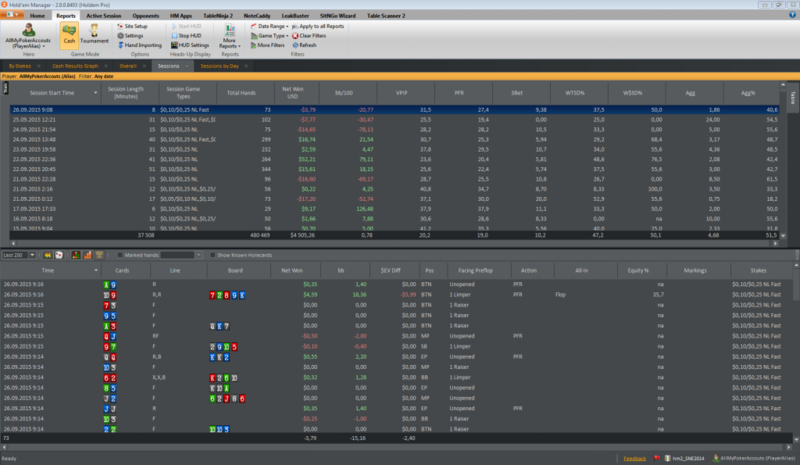 In the central part of the screen there are situated the groups of stats to be usable to find stats manually. In the upper right angle there is “searching” for the most convenience. For removal unnecessary stats it is need to select this stat and press the button “to the right”. For addition stats it is need to select theirs in the right column and to press the button “to the left”. Down bellow there is the button “Default Stats” to kick off our settings. After rectifications it is necessary to press “OK”, otherwise our settings will not be saved. For example, I added “$ EV/ hand” and “$ USD / hand”. 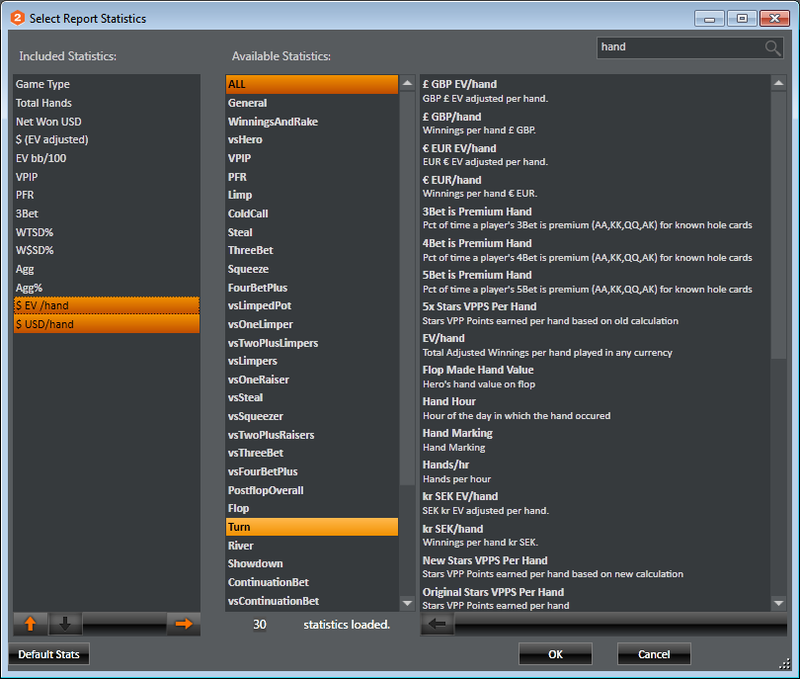 Complementary Columns with Statistics you can add almost on all Reports Tabs. Also it is worth to note that in the bellow part it would be able to select one or some hands and to click the right button of the mouse on any line and to see this window. It would be able to open hand in Replayer and to open all selected hands in it. 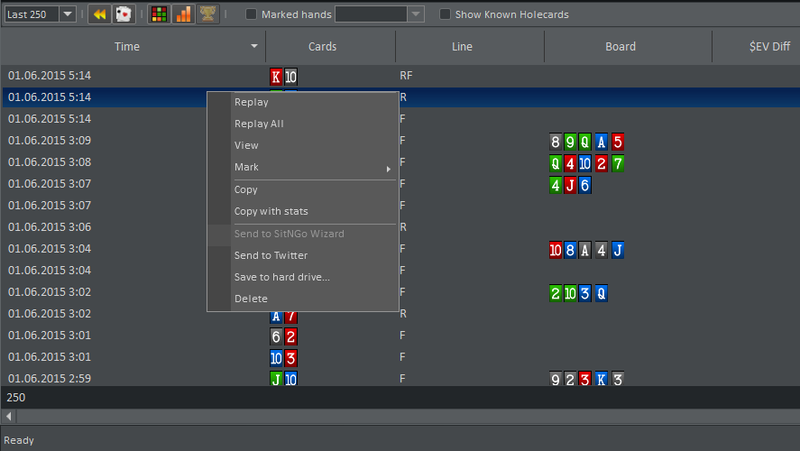 “View” opens hand in the short format as well as in the game at the table. With the help of “Mark” it would be able to notice the deal by special way, as “Bad Beat”, “Bluffs”, “For Review”, “Suckouts” and to add you own tag. Let’s go through other Reports. On “Cash Results Graph” you can see beautiful graphics which it would be able to make in the bellow left part of the screen. “Overall” shows all hands in one string. On the tab “Sessions” hands will be displayed according to the sessions. 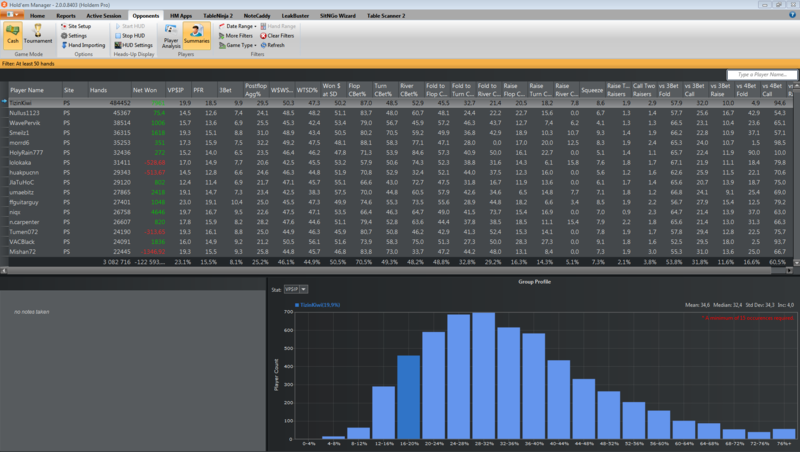 Here it would be able to analyze in what days or in what hours your game is the best and in what – the worse. 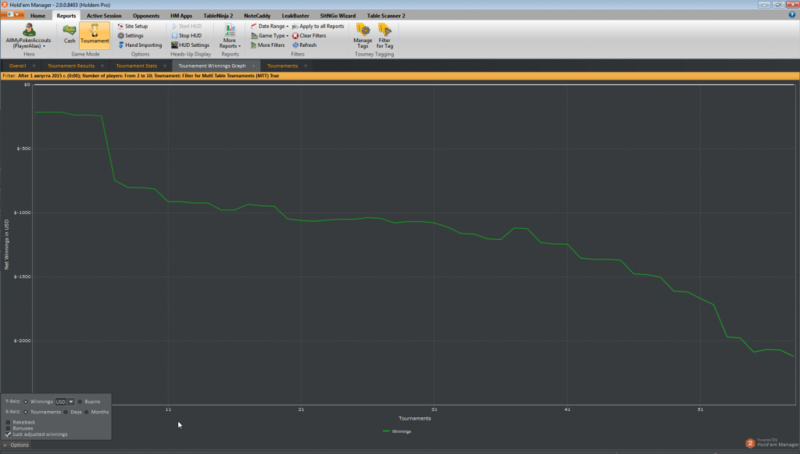 That tab “Session by Day” is useful for analyze the game by day. Now let’s add the double tabs. All of them we will not view, but you can experiment and find what is better precisely for you. 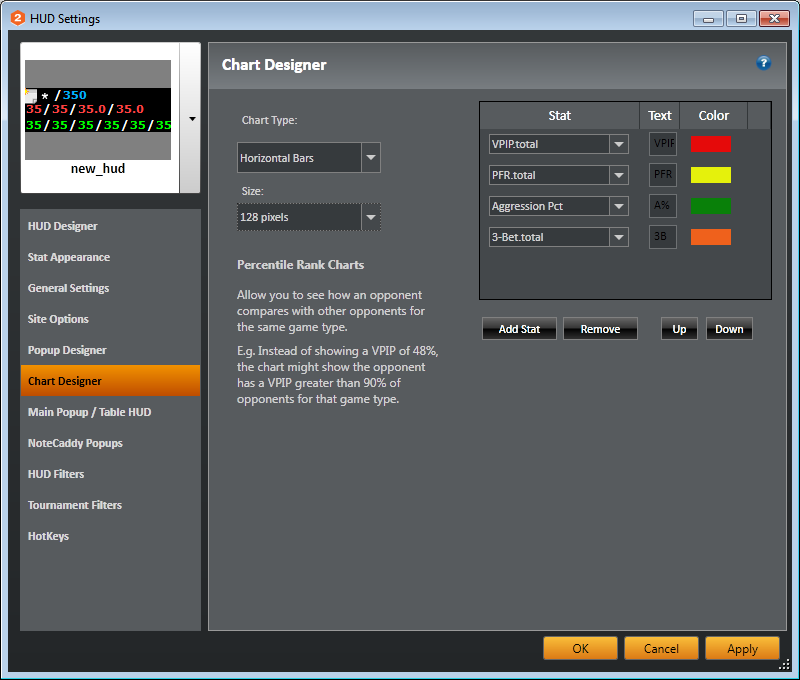 The tab “VsPlayers” will allow us to analyze the game against opponents, whom we do a bunk the most, whom – the less. It is suited to analyze the game against Regurals, because we need large data retrieval for any conclusions. It is possible it seems that opponent is weak but really we do a bunk to him. The tab “Stack Size” allows you to understand in what stakes you win more, in what – less. It is actual if you are playing on the strategy MSS or are staying at the table with very Deep Stack according to strategy BSS. Do experiment and poker will open for you from the new side! All sections have “Quick Filters” in bottom right side of the screen, where you can use quick filters. But, let’s examine all sections in the pop-up window by creating a custom filter. “Basic Filters”. Here you can see several sections. 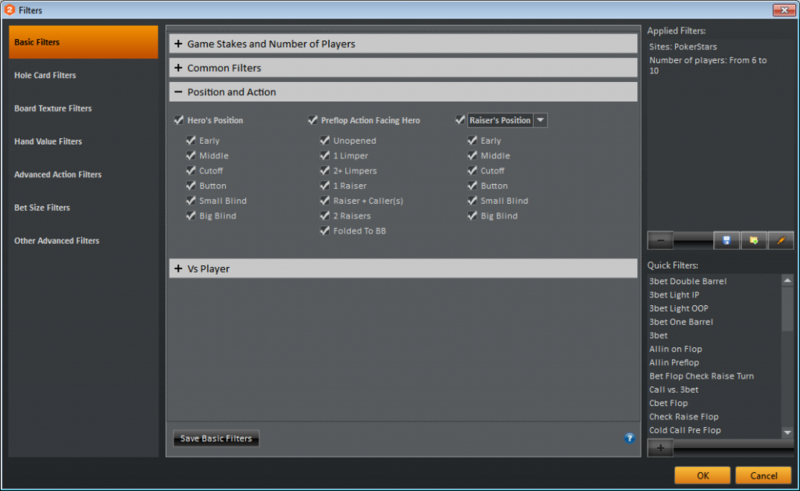 – In “Game Stakes and Number of Players” you can filter poker-rooms, how many players played on the table and limits, which we want to stay in our filter. 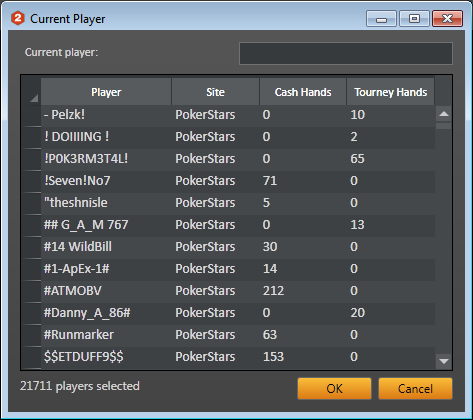 For example, I chose only PokerStars, from 6 to 10 player. – In “Common Filters” you can filter hands whether events were like VPIP, PFR, or the flop was opened and others. 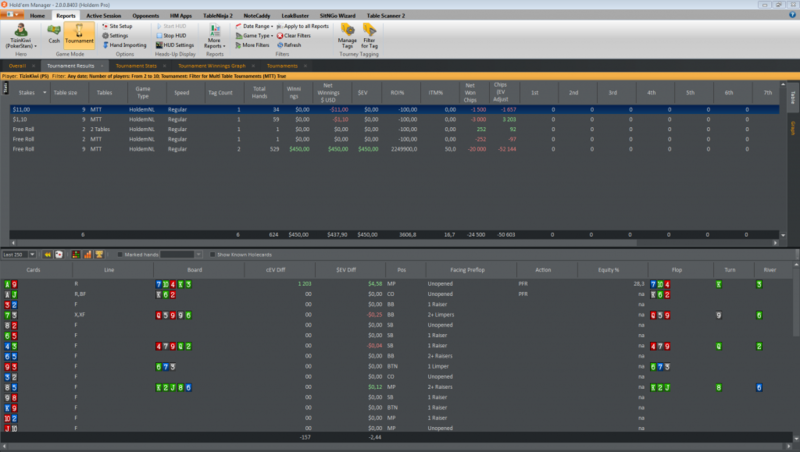 – “Position and Action” Here you can filter in what positions was Hero, what and how many events were on the table, like “1 Limper”, “2 Raisers” and others. If raiser was, then in which positon it was. For our example, I add only BTN position for Hero. – “Vs Player” Here you can set up hands against any opponent. You can also add filter “where you won/lost”, if you want to see how we lose or won. The next section “Hole Card Filters”. Here you can customize those hands we want to stay to analyze. In out case I chose all cards. 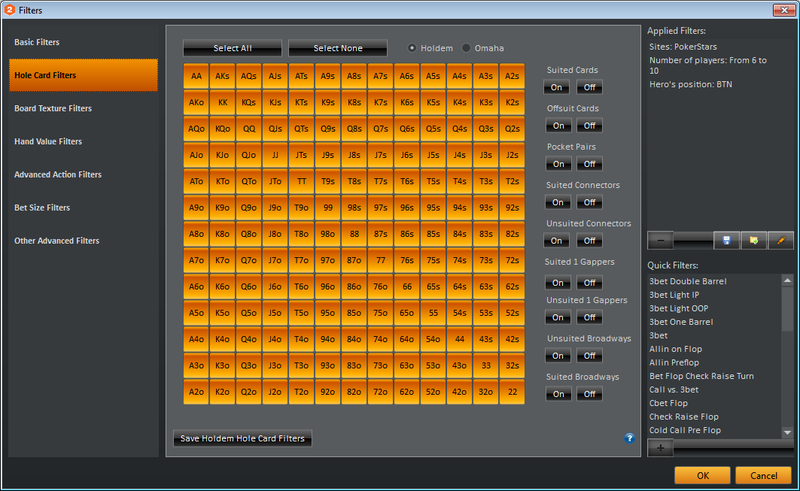 But you can set up various of filtration, for example you can leave only Pairs and all Suited Cards. In “Board Texture Filters” you can filter hands where it was Flop, Turn or River with specific parameters, e.g. there were three suit cards on the board or the board was paired. In our case we used “Flop HighCard”. In dropdown menu let’s choose Ace card and press “+”, otherwise filter will not add. You could add a lot of filters. Below you can choose one of the conditions “OR” or “AND”. For our example it will be enough. In “Hand Value Filters”, you could filter the hands like “Filter by Flop Hand Strenght”, “Filter by Turn Hand Strength” and “Filter by River Hand Strength”. 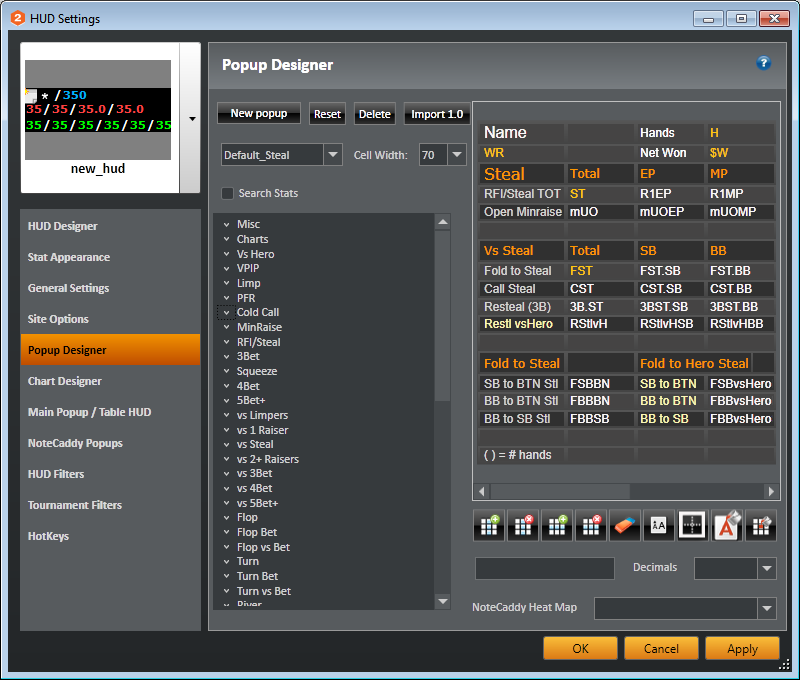 There is a large variety of poker combinations from High Card. But in our example I didn’t use it. “Advanced Action Filters”. In this section you could tune filter according to the actions were made on the Preflop, Flop, Turn or River. It’s a little bit difficult but very convenient. Also you can use radio buttons for convenient switching. You can invent filter where 2 Raise Preflop and 1 call were made and consider all hands with this particular situation. 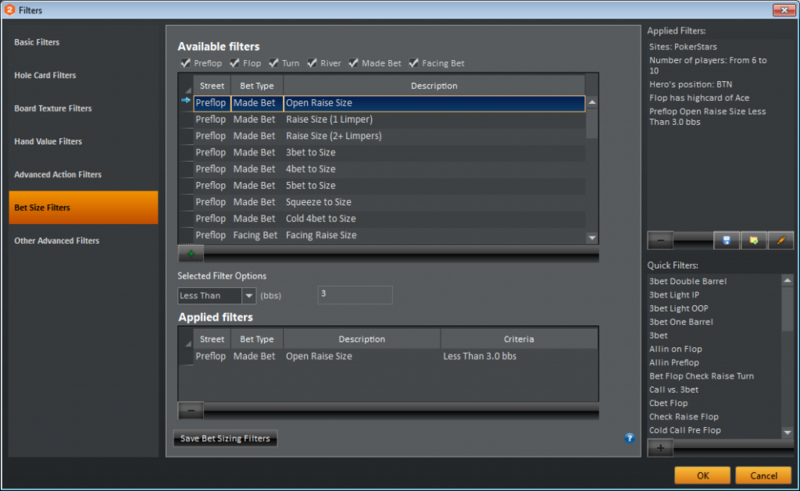 In “Bet Size Filters” you can customize everything that is connected with Bet Size. For our example, I consider the case when Preflop Raise has standard size. Standard size in Big Stack Strategy is 3bb and less. For this you can select “Preflop Made Bet” in top side. In bottom dropdown menu choose “Less Then” and value for BBs. After that, press “+”. 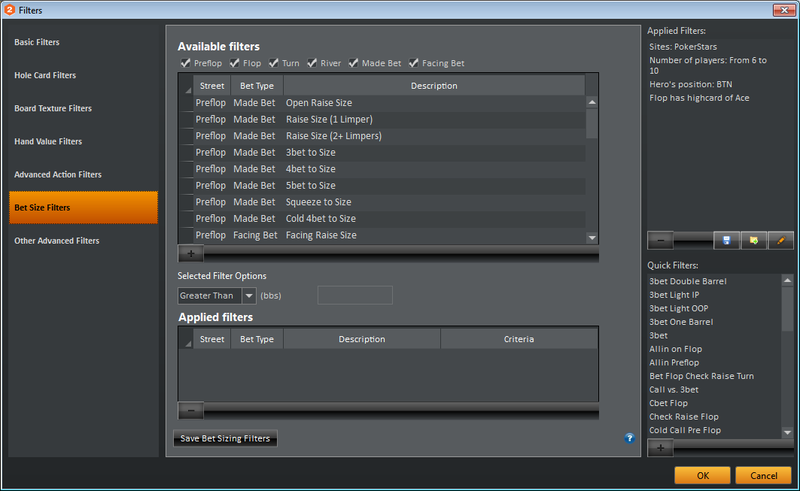 In last section “Other Advanced Filters” you could set up the filters which we couldn’t set up earlier. There are a huge amount of filters, for easy navigation on them checkboxes are provided in top side of the screen. 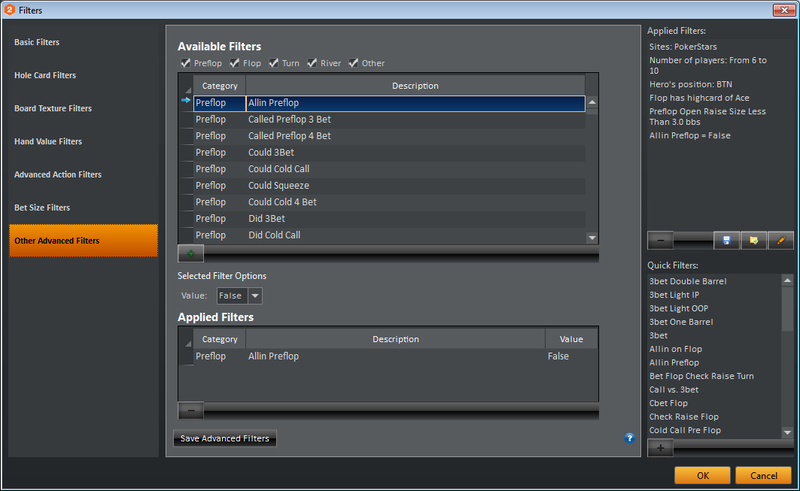 For our example, we use filter “Preflop Allin Preflop” and set “false” in the dropdown menu. 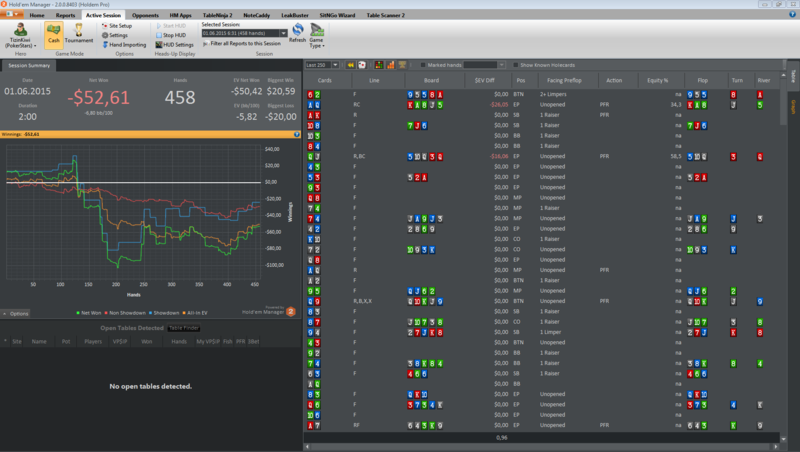 So we exclude the events where it was raise less then 3bb and there was no All-in. It’s possible if Hobby Player has less then 3bb in his stack. Let’s save our filter. Press button like on the picture. Let’s give it a name and press “OK”. Also, press “OK” in “Filters” window. Now we see only the hands where our filter works. In the bottom side of the screen you can consider each hand. 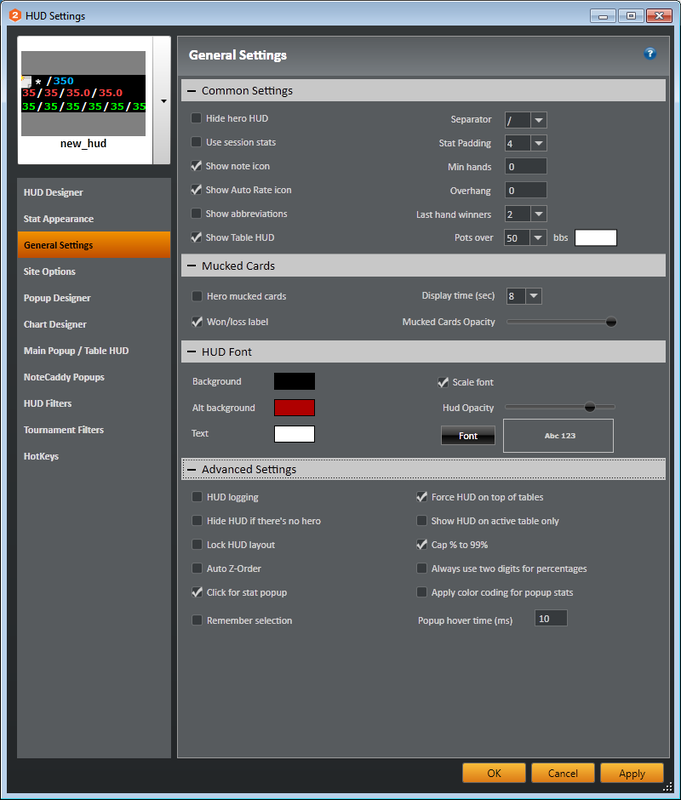 For import filters use button like on the picture. In this section, we will create your own HUD. To do so press “HUD Settings” on the top panel. 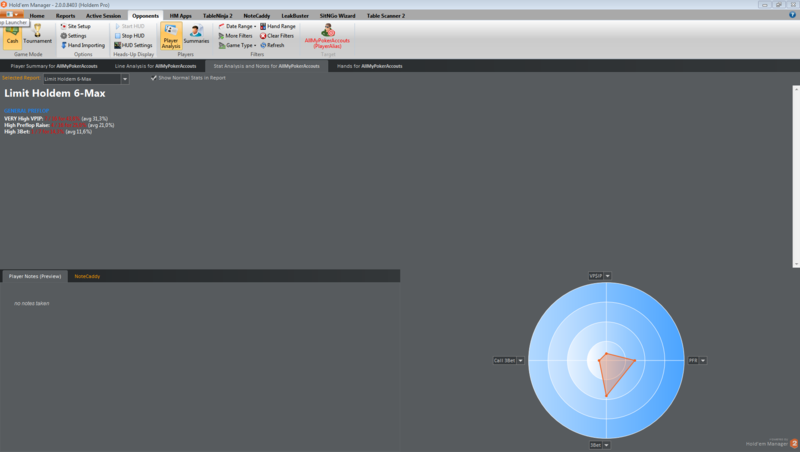 Examine all sections in the pop-up window. 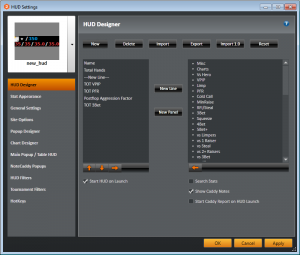 In “HUD Designer” you can add and remove HUDs. Import and Export buttons don’t require explanations. 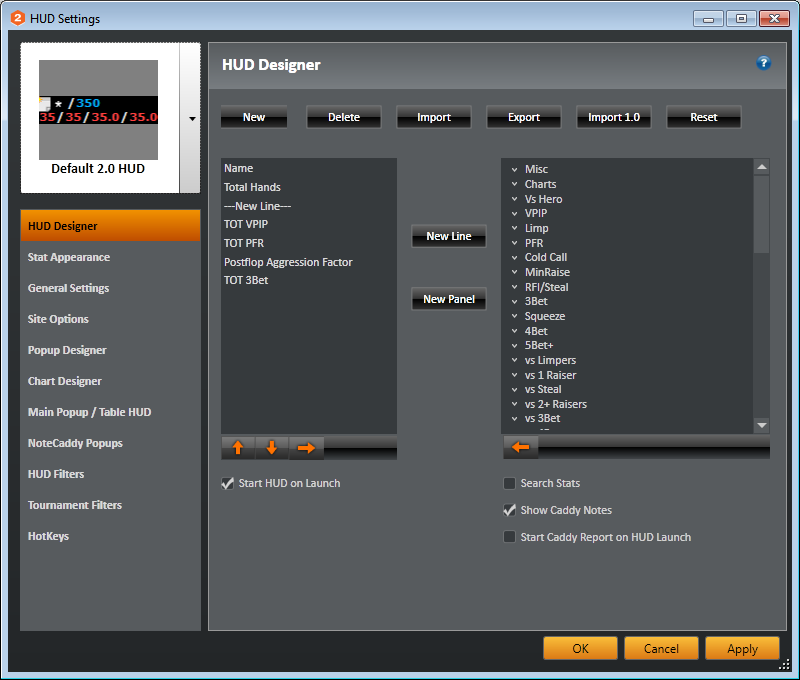 “Import 1.0” allows to import HUDs from old Holdem Manager 1. You can use it if you want to start to use Holdem Manager 2, but you don’t want to waste time on the customization. On the left side you can see stats displayed on the poker table. If you want to remove something you have to select stat and press button “right”. If you want to add new stat you have to select stats in the right side and press button “left”. You can use “New Line” and “New Panel” buttons for comfortable sorting stats in you HUD. Panel differs from Line by one feature, it allows you to move your HUD panel separately from any player HUD block, if you need it. Let’s add few stats and go further. In our example I added several stats from “PFR” section. In “Stat Appearance” you can customize color schemes for each stat, for example, “EP RFP” can be green if PFR value is between 0 and 10, grey – between 10 and 20, and red – between 30 and infinity, or vice versa. I left as it is, I like when stats don’t change his colors in the game. Also, here you can customize Abbreviation, Decimals, Min Samples, Popup for each stat, font and Dispalay for Hero and for Opponents. In the “General Settings” you can tune many different parameters. Usually, I increase only opacity slider value. Also you can change “Display time” for Mucked Cards. “Site Options”. In this section you can set up for what type of game, poker-rooms and limits the HUD are used. If you have only one HUD, select “ANY” in all dropdown menus, press big white button and choose you new HUD. Below you can set up “Live Tracking”, which can grab your played hands street by street. In “Popup Designer” you can design POPUPs for you HUDs. 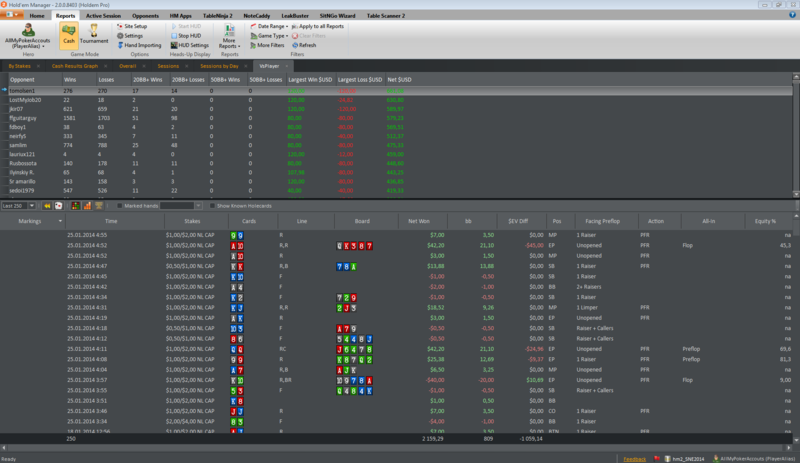 There is available all Holdem Manager 2 stats too, including NoteCaddy stats. 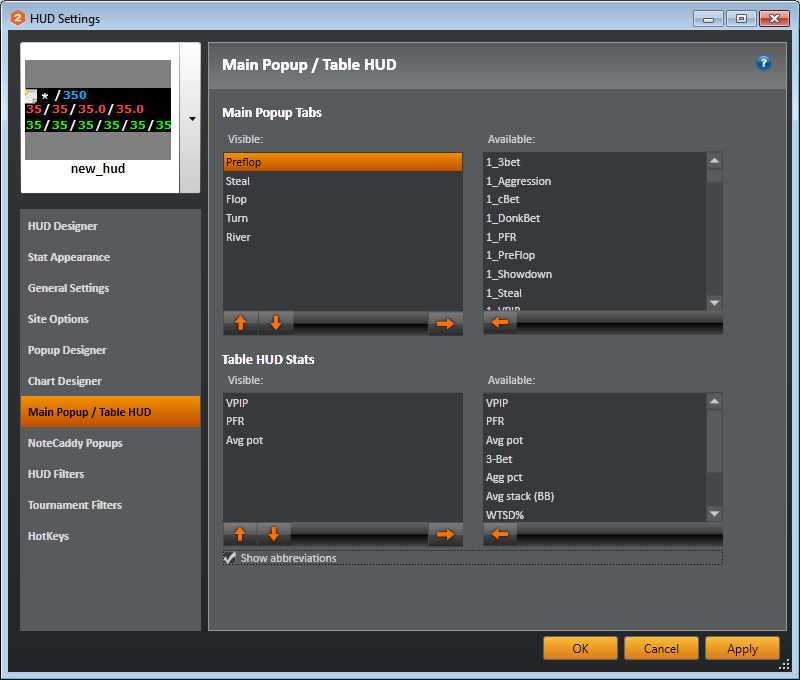 Design POPUPs is based on table design. From the very beginning of the using of Holdem Manager 2, I recommend to use only standards POPUPs, because POPUPs creation is laborious process. “Chart Designer” is designed for customize you HUD as Bars. 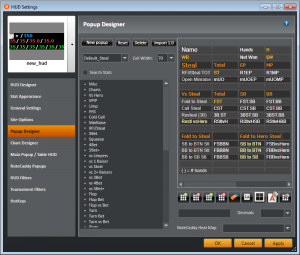 “Main Popup / Table HUD”. In this section you can tune your Tabs in POPUPs. It’s useful, but be careful, if you add too much Tabs, it can lead to a long time opening your POPUPs in the game. 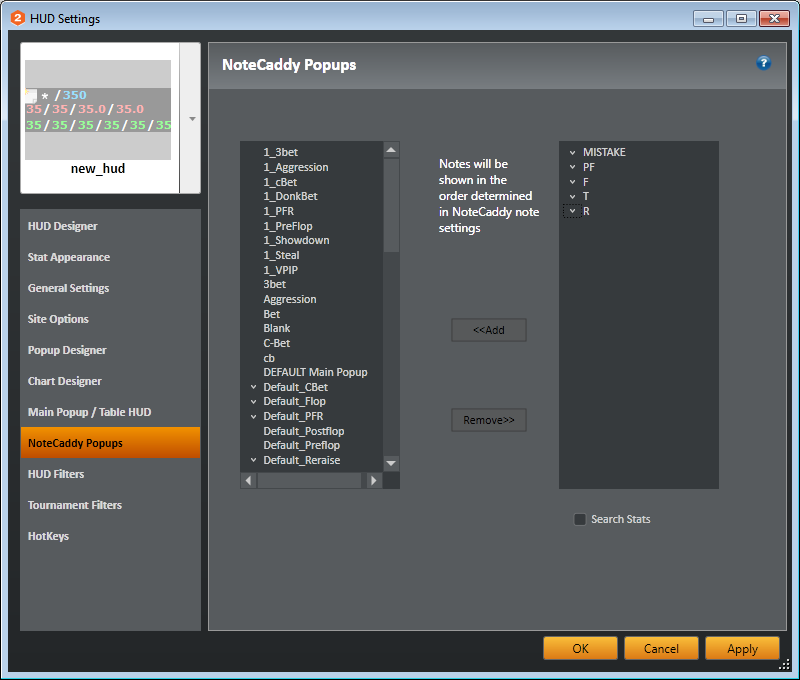 “NoteCaddy Popups” is designed for NoteCaddy Popups. 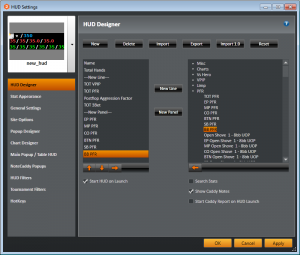 In “HUD Filters” you can set up how your HUD will be work. Usually the number of the players changes at the table, therefore I use Default scheme. It allows me to have an idea about how a new Hobby Player will play on this table, when I have a small amount of hands on this players. But you can use another “Recommended Settings”, if you think this is more convenient. How it will be look like you can see on the pictures below. Also you can set up how old hands you want to display or how many last hands you want to display. Also you can chose how to display hands from others limits, together or separately. Obviously, players can play in different ways on different limits. “Tournament Filters” is very similar with previous “HUD Filters”, but it is used for tournaments. Here you can also choose between “Default” and “Recommended” Settings. “HotKeys”, In this section you can on/off HotKeys the using for comfort. With hotkeys, you can use features such as, mark the current hand as “For Review” or another type, the coping hand history on Clipboard and others. This tab is useful for track the active session or one of previous session, if it’s needed. You can choose “Selected Session” in dropdown menu on the top panel. If something goes wrong you can press “Refresh” to fix it. 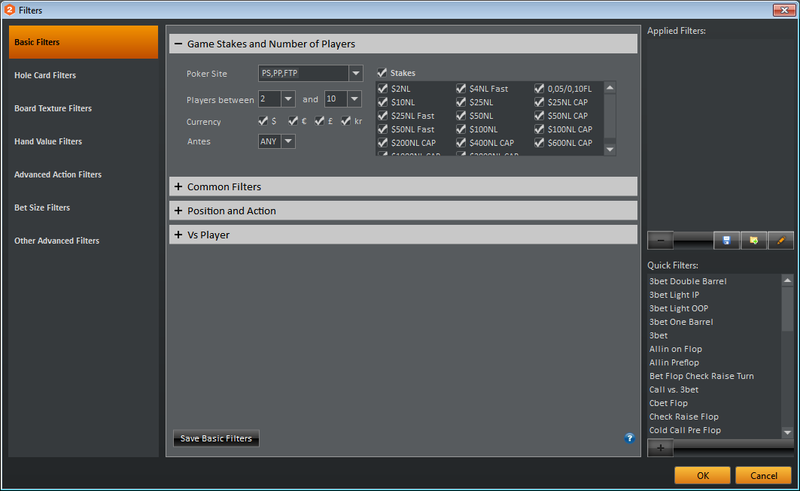 In the dropdown menu “Game Type” you can choose all or some game types like Holdem No Limit, Holdem Pot Limit, Holdem Fixed Limit, Holdem No Limit Cap, Holdem No Limit Fast or All Holdem, or All Omaha. It’s useful if you play Omaha and Holdem in the same time and want to look graphics separately and understand where you lose or where you win money. 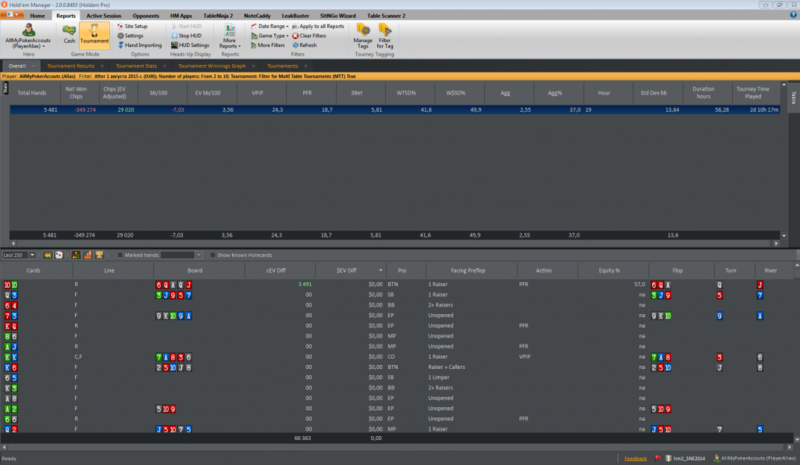 The current session diplays on the left side of the screen. Below it you can open and use Table Finder. There will be display tables which Table Finder found. 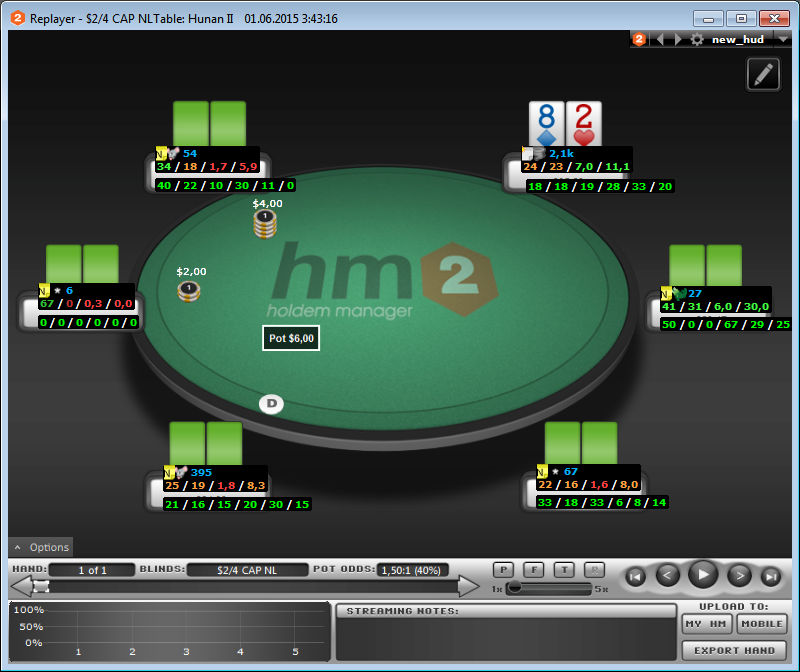 On the right side of the screen you will see standard window with “Last Hands”. Here you can mark hands for subsequent analysis. The top panel for “Tournament” section is similar to “Cash” section with the one exception. “Cash” section has “Manage Tags” and “Filter for Tag”. 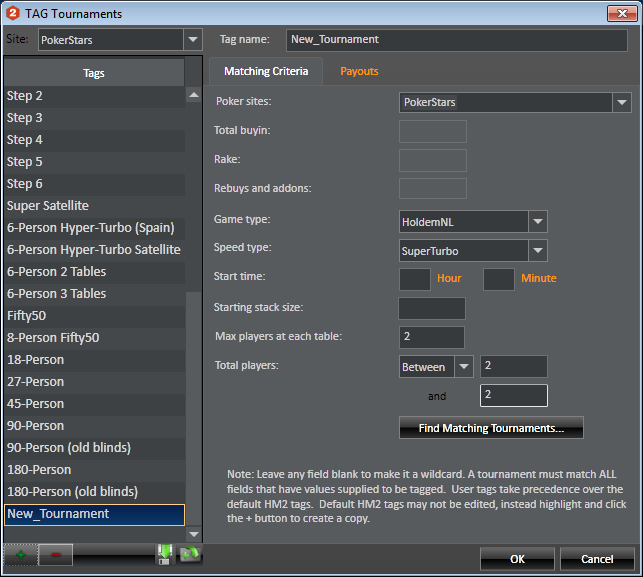 The first button is used to customize the tournaments types. 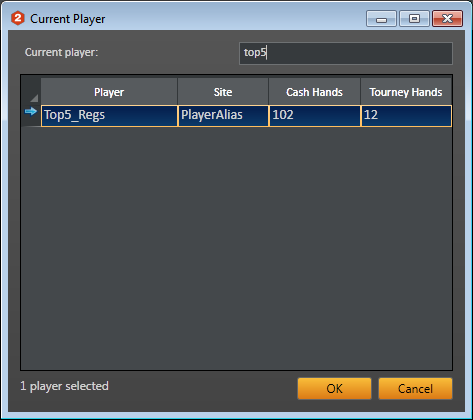 There are already almost all tournaments from all large poker-rooms. 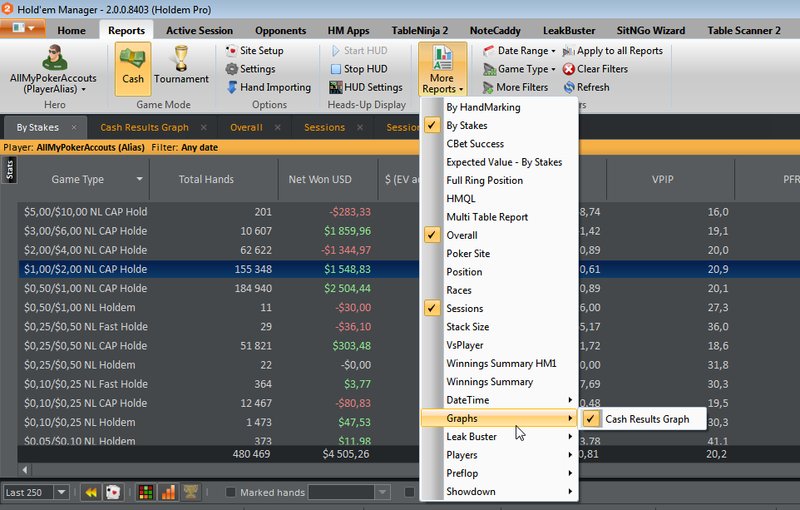 If you play in tournament in small poker-room which is not yet in the Holdem Manager 2 database, you can add this tournament in the pop-up window by pressing ‘+’. In the opened window it is need to put “Tag Name” and tag from which you want to make a new tag. Press “OK”. Now, in the right side we can tune our tag. You have to define “Poker Site”, “Total buy-in”, “Rake” and other our tournament features. In “Payouts” you have to input the tournament payouts structure. Press OK”. 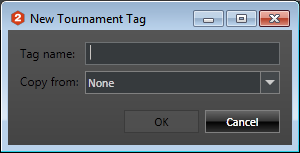 Now we can filter our tournaments with “Filter for Tag” button. Let’s move to tabs review. If you read article about “Reports” Section, it’s similar. 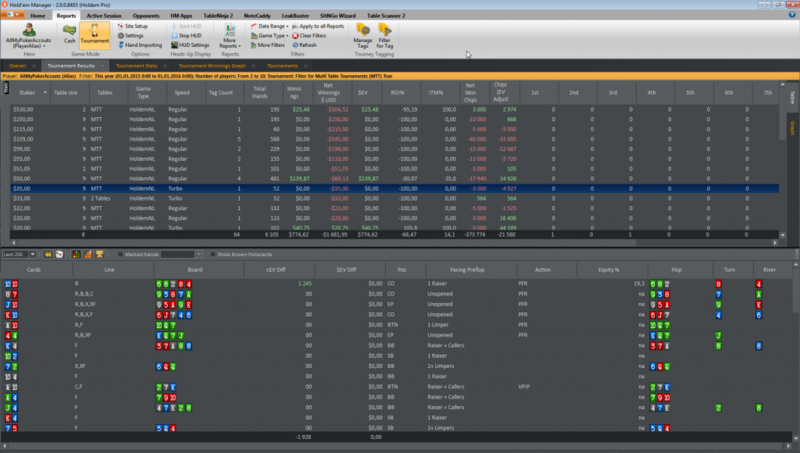 “Overall” tab shows all played hands. Here I got the little downstreak. On “Tournaments Results”, you can filter tournaments by Buy-in and under-stand which tournaments are played well, which not. 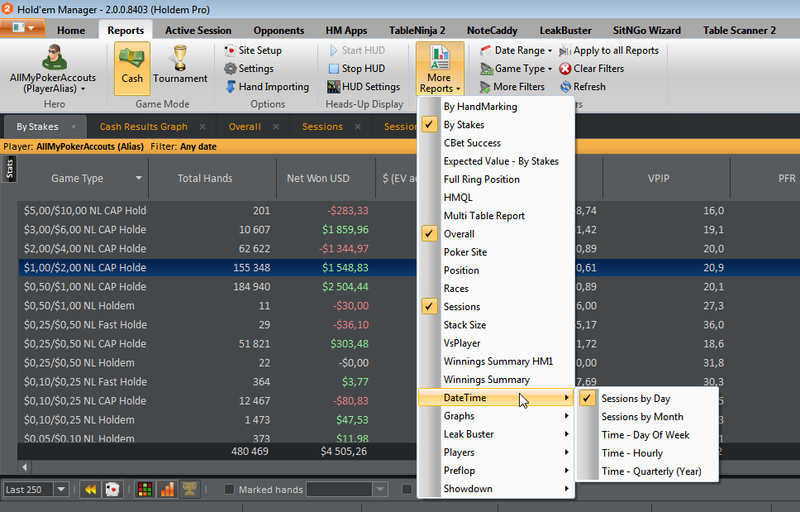 “Tournaments Stats” Tab is suitable for SnG tournaments, here you can look on your ROI%, ITM%, $/hour, as well as how often you place on the 1st, the 2nd, the 3rd places. Maybe you are good in 9 players SnG, but maybe you have some problems in Heads-Up, it can greatly influence at your results. “Tournament Winnings Graph” is not very useful, but you can customize it in bottom left angle. 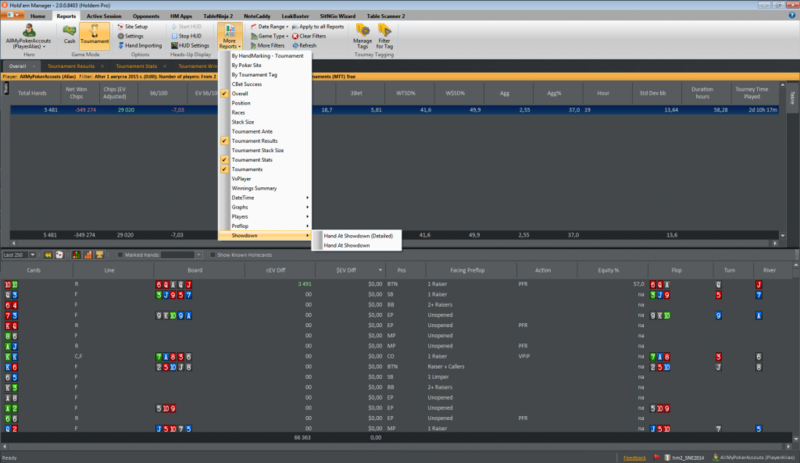 “Tournaments” Tab is very good for sorting your tournaments by date. This tab is the best place for analyze the opponent game. Here you can quickly understand you opponent advantages and disadvantages, where he loses money and how he plays on each position of the table. If you press “Summaries” button on the top panel you will be moved to another window, in which are displayed stats of every player in the easy table. Here you can click on your opponent name and see the graphics on his stats, how they are related with all others players stats. In the left side on the screen you can see Notes for selected player. On the top panel “Players Analysis” button opens the section with the following tabs: “Player Summary for ‘Your Opponent Name'”, “Line Analysis for ‘Your Opponent Name'”, “Stat Analysis and Notes for ‘Your Opponent Name'”, “Hands for ‘Your Opponent Name'”. For example I chose myself as an “Opponent”. To do so I chose our Alias name in the “Target” button. On “Player Summary for ‘Your Opponent Name'” tab we can see basic information like Hands, Net Won and others, and infographics for each limit played by opponent, where he loses, where he wins. On the bottom section you can see graphically presented opponent stats vs all players, left side is clickable. 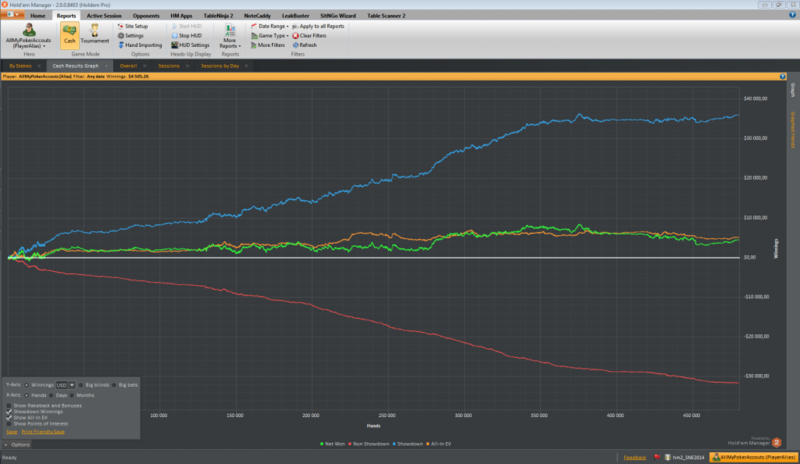 Below there are located Flop Stats, Turn Stats and River Stats. 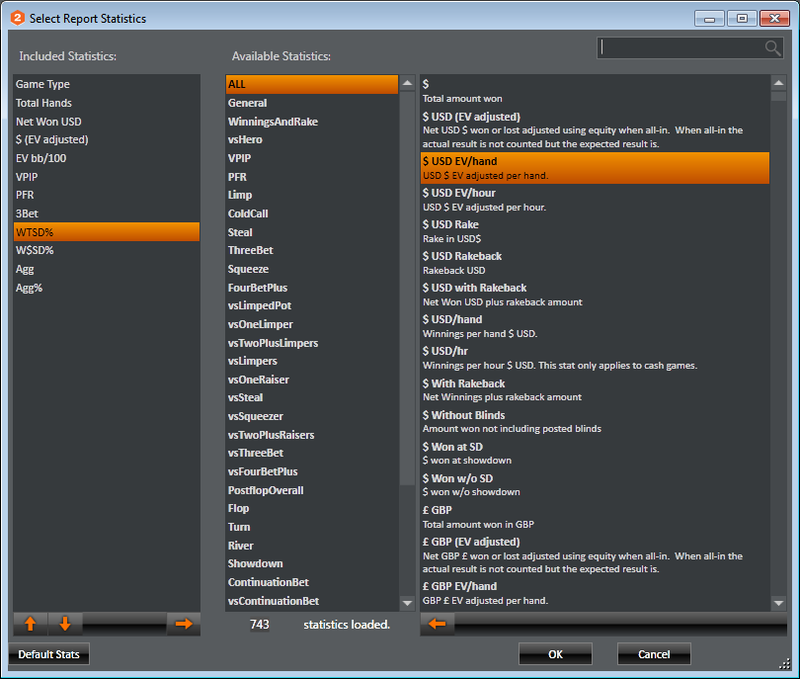 Because this stats require big amount of samples, I recommend you use this tab for analyze Regular Players only. It’s the best place for find his leaks. 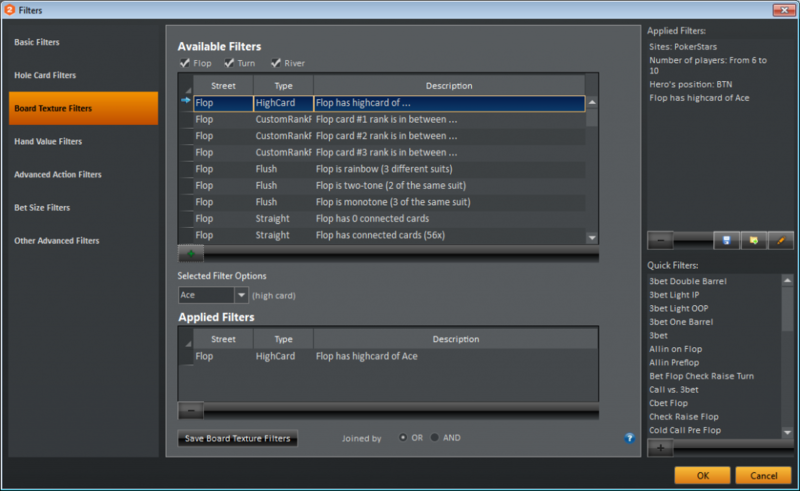 “Line Analysis for ‘Your Opponent Name'” is useful for filtration of opponents’ hands by position, by Flop Board Texture and Preflop Line. 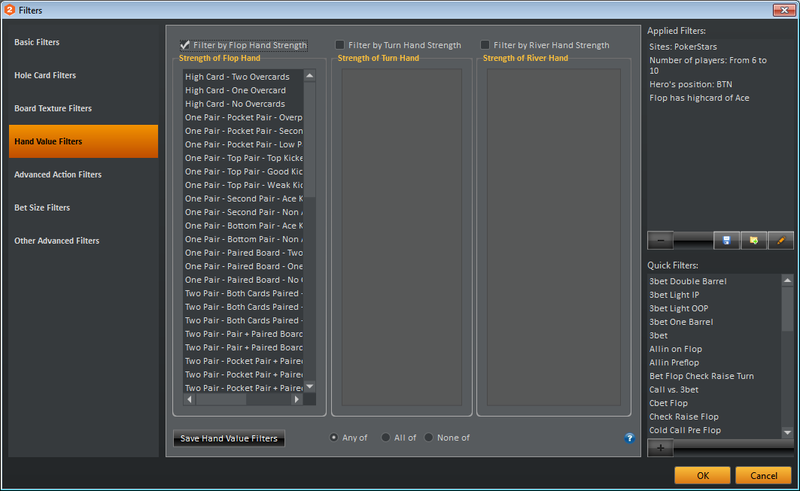 Customizing Flop Board Texture you can rate, for example, opponent style when he is out of position on Ace High board. In the bottom side you can see useful infographics, which shows what opponent has in this situation and how often. In the left side you can see specific hands. On “Stat Analysis and Notes for ‘Your Opponent Name'” tab you can get even more visual representation of opponents stats by Game Type in the dropdown menu relative to other players, but I think this tab is excessive and I don’t use it. 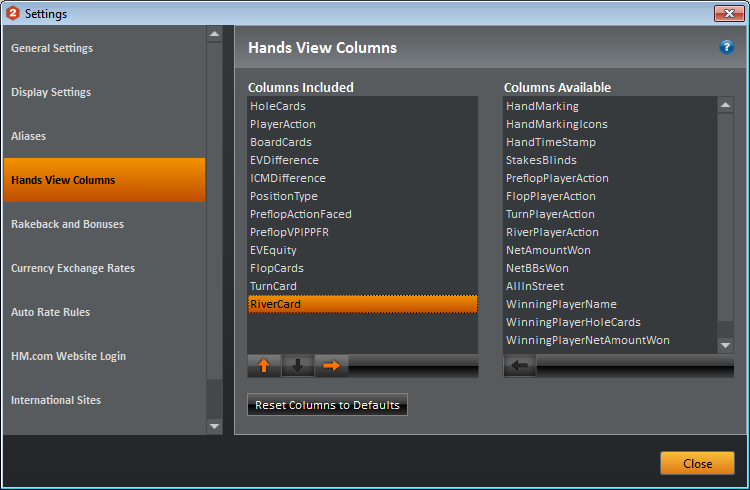 On the last tab “Hands for ‘Your Opponent Name'” you can sort you opponent hands with dropdown menu by Hand Type.